27 May 2014, 5pm. Gipsoteca, San Paolo all’Orto, Piazza San Paolo all’Orto, 21, Pisa. 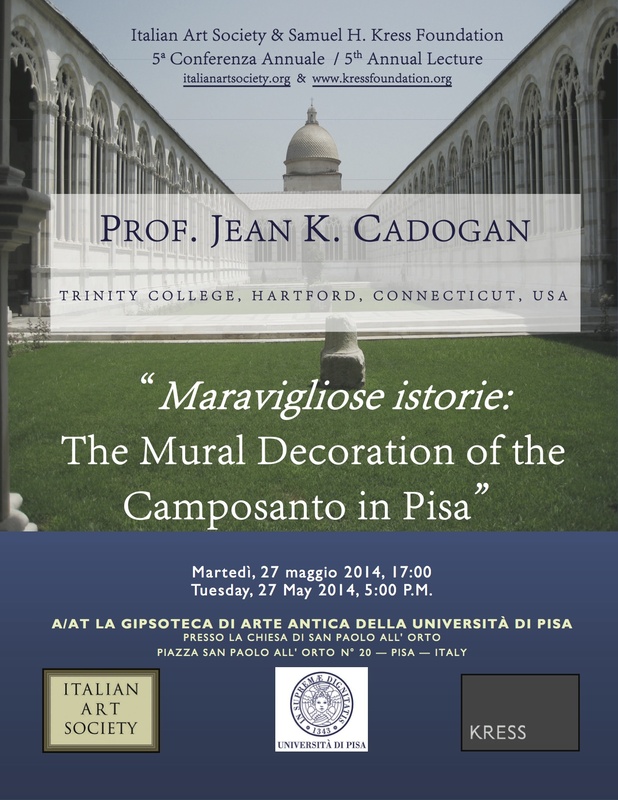 Jean Cadogan will present the 2014 IAS/Kress Lecture, “Maravigliose istorie: The Mural Decoration of the Camposanto in Pisa.” Her lecture will examine the murals painted by Benozzo Gozzoli in the context of the changing civic function of the Camposanto in the fifteenth century, as well as altered economic, social, and political conditions in Pisa. Dr. Cadogan is Professor of Fine Arts at Trinity College in Hartford, CT and the author of Domenico Ghirlandaio, Artist and Artisan (Yale University Press, 2001). The Gipsoteca of the Università di Pisa will host the lecture with sponsorship by the Dipartimento di Civiltà e Forme del Sapere. Lecture starts at 5pm with a reception to follow the talk.